CTV/Music Team/Roi, CT (V) 74. 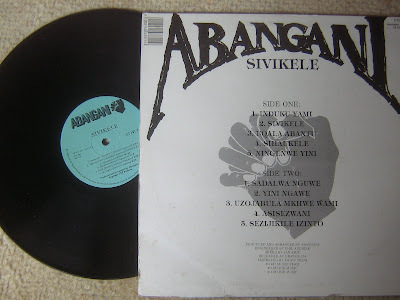 By the late 80’s, traditional music forms were making a comeback with young urban audiences, in part prompted by mbaqanga-inspired projects of foreign enthusiasts such as Paul Simon, Harry Belafonte and Malcolm McLaren. 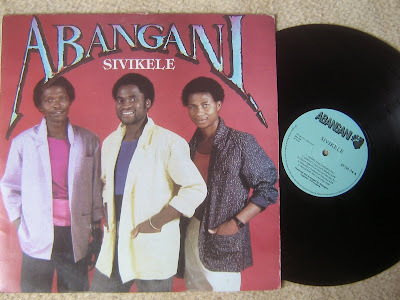 Signalling a departure from the bubblegum trend, Abangani’s sound was more traditional, although Western fashion influence is obvious on the cover photo – shoulder pads and rolled up sleeves were big news. The extensive liner notes of Sivikele ("we defend") bear testament to the group's professionalism. "The group was formed in 1979 by Tom Mkhize," it begins, "and is a registered trademark." Besides producers/composer Tom Mkhize, the band comprised vocalist Sibusiso Mbatha, Ishmael Ngwenya (keyboards) and Khabzo Mkhize (bass). "Through the years they have progressed with their music and have sold many gold records. Their fans write to them from all over Africa, and they even have fans in the USA.” The album was sponsored by the Ace Maize Meal Jazz Foundation, formed "to promote and advance the interests of South African Black Jazz in all its aspects."